NOTE: There is a huge difference between astrology and astronomy. Astronomy is a natural science that deals with the study of celestial objects (such as stars, planets, comets, nebulae, star clusters and galaxies) and observing the cycles in the heavens. Astrology is witchcraft, where they believe the order of the stars lead them to a successful life or warn them of things coming. In biblical times, watchmen were posted on the walls surrounding the city. They not only watched for an enemy approaching, they also recorded anything happening in the night sky. From historical events on earth during the same time that unusual heavenly events were recorded, they observed a relationship pattern of occurences relating to heaven and earth. (Israel’s calendar is linked with the cycles of the moon, but keeps with the solar cycle by their leap years). When Jesus told His disciples what would be the signs of the end of the age in Mark 13, some of them involved signs in the heavens. Mark 13 closes with Jesus commanding them to ‘watch’ 4 times. I consider myself to be a Watcher, and observe what is happening in the heavens relating to the Last Days. When unusual signs are seen in the heavens I watch, pray and record. A lunar eclipse is when the moon passes behind the earth such that the earth blocks the sun’s rays from striking the moon (like a red sunset). This happens when the sun, earth and moon are lined up exactly or very close and always comes at the time of a full moon (middle of the lunar month). There will be 2 total lunar eclipses (blood moons) in 2011. The first will be June 15 and the second December 10. 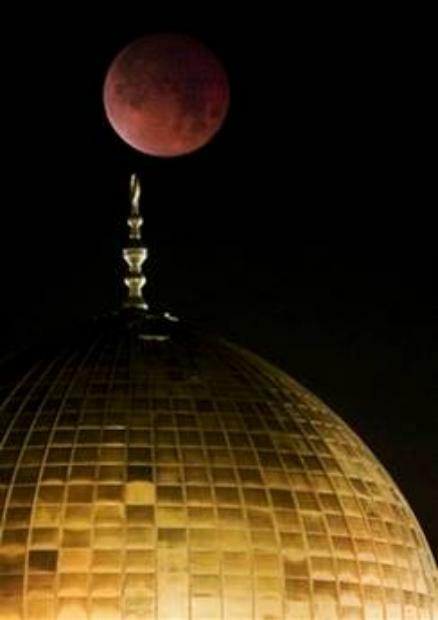 This blood red lunar eclipse will be over all the nations that are in turmoil in the Middle East. This will be the darkest lunar eclipse in almost 100 years and will cover 2 days and will last 1 hour, 40 minutes & 12 seconds! It will be seen in East Africa, the entire Middle East (including Jerusalem), Central Asia, Western Australia and will mid eclipse in the Mauritius. (This will be USA 4:14pm EDT) North or South America will not witness this event. Below are some interesting historical events that happened on earth when there were lunar eclipses. 1 BC- Only eclipse that Josephus recorded, at the time of the death of King Herod. January 28, 632 AD, (solar) visible over Medina, Arabia. This is the year Mohammad, the founder of Islam died. March 1, 1504, called the Columbus eclipse, when Columbus and his men were being held captive and Columbus read in the almanac that there was to be a lunar eclipse that evening. He told the natives if they did not let them go, he would make the moon go away. They were released soon after. September 26, 1996 following the blood moon renewed violence broke out between the Palestinians and the Israelis (due to the opening of a tourist tunnel near the Dome of the Rock), after many months of comparative peace. November 9, 2003 – A large explosion rocked a Riyadh residential compound housing foreigners and Saudis a day after the United States warned of terrorist attacks in the kingdom which is battling a surge in Islamist violence. Thousands of Saudi troops were deployed in the holy city of Mecca to provide additional security until Ramadan is over. February 21, 2008-Israeli PM Ehud Barak and IDF Chief of Staff Gabi Ashkenazi spoke in preparation for war with Hezbollah and Hamas, and both these terror organizations leaders were bold in their rhetoric against Israel in this time of great tension. As a long time amateur astronomer I have often wondered about the significance of eclipses in bible prophecy. Now I’ve always understood prophecy to be a foretelling of future events by a higher power. If that is true, then what you are implying here is that He predicted these events by scheduling various eclipses to occur in conjunction with these events. But we all know that eclipses are all on a fixed time schedule and have been predictable for thousands of years. Therefore to get the prophecy to work, God would have to manipulate the events of man to force them to happen at these precise times. But God is not a puppet master – He has given man free will, so I don’t see any of this as being more than just coincidence. And with so many eclipses occurring over history, it isn’t difficult to go back thru the list and match them up with some semi-significant human events. So while I find this an interesting exercise, I don’t think there is any real prophecy going on here. Thank you for your comments. I don’t try to read anything into it, but rather ‘watch’. The first question in the New Testament is “where is he that is born the king of the Jews. We have seen his star and have come to worship him”. From recorded history the magi learned from the teachings of Daniel, who never left Babylon (nation of stargazers). Up to the time the Jews were taken to Babylon they watched and logged heavenly events. My thoughts are when they were taken to the nation of ‘stargazers’ who worshipped the heavens, instead of the One who created the heavens, they no longer looked for signs. I think it is very interesting that ‘blood moon’ and sun turning to sackcloth are signs of the end of the age. I watch, log and share. I get what you are saying, I have discussed this with others in the past. But I just wonder what you are watching for. Anything specific to prophecy? I see prophetic events unfolding all the time just watching the news. We can all tell we are in the end times, which began with the state of Israel in 1948. Things have been happening regularly since then. There have been dozens of eclipses and other astronomical events since then, but nothing that is obviously biblical in nature. I don’t think you are expecting the second coming every time there is another eclipse, especially since there are so many other major prophetic events that must happen before then. Perhaps the seals of Revelation will occur on eclipse days, who knows. We shall see. But the fact a darkened sun and a blood moon can never occur at the same time by way of eclipse tell me that perhaps the effect is more from a nuclear winter or and asteroid strike or volcanic eruption – all of which are predicted in Revelation, If John were to see any of these three events in a vision, he would not understand what any of them actually were, so he might easily just describe the common effects from each of them as the darkening of the skies and the dimming of all heavenly bodies, including stars – which is also mentioned but can not be attributed to an eclipse. So therefore I will also watch, but with no expectations. That way I won’t ever be disappointed at least. While these events are interesting to note, they are human events – not acts of God. God did not command Queen Isabella to begin the inquisition, nor for any wars to start. And NASA will confirm that the times of the eclipses were not manipulated by a higher power – they occurred right on schedule. Not that something important won’t occur around these dates – there is a lot of prophecy unfolding all the time. The 7th king of Revelation (next to last) just became official last December – without any accompanying astronomical event, however. (That was the formal creation of the European Union – the revived Roman empire). So I’m not expecting much to happen, either in the next 5 days, or in 2014/2015. But I will be curious to see if anything actually transpires – and of course I’ll be out there taking pictures of it (It’s what I’ve been doing since I was six). Interesting is NASAs findings regarding tetrads (back to back blood moons in 2 years) re: the Jews and their feast days. 1493 & 1494 there were back-to-back blood moons on Passover and Tabernacles following King Ferdinand and Queen Isabella demanding the Jews out of Spain- Spanish Inquisition; 1949 & 1950 again on Passover and Tabernacles following the War of Indendence; 1967 & 1968 again on Passover and Tabernacles following the Six Day War; the next will be 2014 & 2015. The WORLD SHALL SOON SEE what’ll happen. All the more for believers to keep in CLOSE RELATIONSHIP w/the LORD. For years I have tried to understand and watch signs but I admit much goes over my head. I can’t connect the dots to believe 100% and always feel that more is missing. Each day (especially the last two or three years) the new information that becomes available amazes me. I have never heard about the blood moon before and each conversation reveals something new. Both have good points to consider. This is stuff we should all be aware of but were failed by those we trusted. No wonder we are so lost and so many are looking for answers to all this. I think most people are looking for truth to do good and be on the right side when everything is finally revealded. I think it’s important to know that astronomy, not astrology, will be involved in the Lord’s return, and I agree that we should watch. I’ll be watching in 14, 15. OK, the eclipse is over. So what prophesy was fulfilled during this event?